Swap out your soft furnishings and add some pops of color to your decor. Been itching to incorporate Pantone’s Color of the Year, Living Coral, into your home? Now is your chance! Swap out those dark, heavy velvet cushions for bright linen pillows. Pack away the faux fur throw blanket and replace it with a colorful cotton one. Exchange thick flannel bedding for a light-weight fabric such as percale. Open those windows. 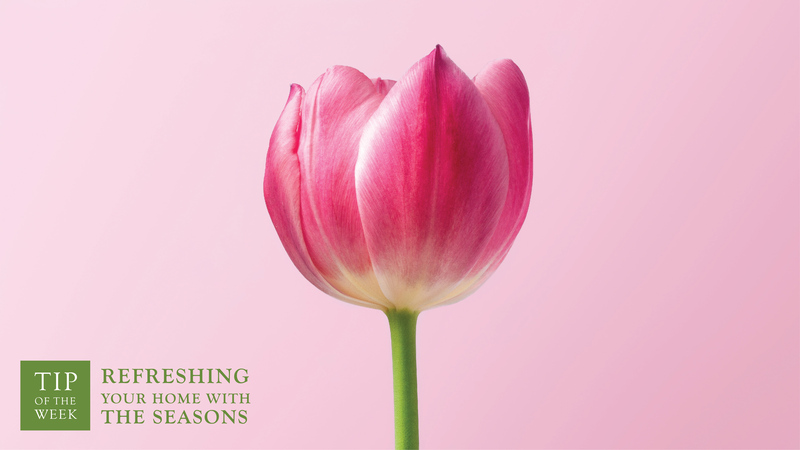 The quickest and easiest way to invite spring into your home is to open the windows. Our homes tend to get stuffy after a long winter of the same stagnant air. Welcome spring and let the fresh air in! Fill your house with greenery. If you’ve been dreaming of adding some indoor plants to your home, there’s no time like the present. Nothing says spring like live greenery in a sunny corner. Don’t have a green thumb? Your favorite vase with a fresh bouquet of flowers can provide the same feeling without the commitment. Add some spring scents. Fall and winter have their signature scents and so does spring. For some, spring brings memories of lavender, lilacs and lilies of the valley. For others, it brings thoughts of lemon squares, carrot cake and fresh maple syrup. Whatever smell spring brings to mind, add that scent to your home. Revamp your outdoor space. Take stock of your outdoor accessories as you bring them out of hibernation. A good scrubbing and a fresh coat of paint can give dull pieces new life. Consider adding some bright new pieces to replace those that are tired beyond repair. Lastly, a propane fire pit and a grill are great additions to any outdoors space.